We walk in life with the desire to make our dreams come true. It's not always easy but the eagerness pushes us to try and try again. a person who helps us to lose fears, doubts and uncertainties until realize our dream. 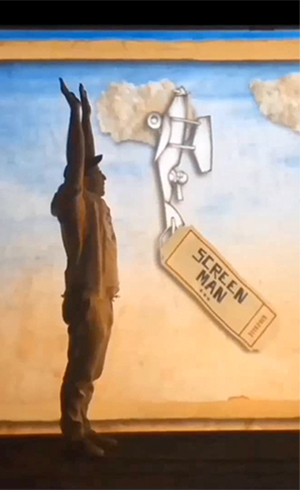 SCREEN MAN is the person on the path of our protagonist. "SCREEN MAN" is following in the same footsteps as "Stone by stone," adding to theprevious show new languages. The work as actor, puppets and objects are being accompanied this time by the use of audiovisuals. The simplicity of the stones gives way to the poetry of images. The drama is developed from the dialogue between the digital and the real, in rotation, to advance the plot. A proposal in which the manipulation of images, puppets and objects, situates the audience members into a magical universe that takes place before their eyes, to tell a recognizable story for all ages and therefore, universal. Desires, individual and collective dreams, will give appointment in this tender story that provides a way for their realization: perseverance and passion.